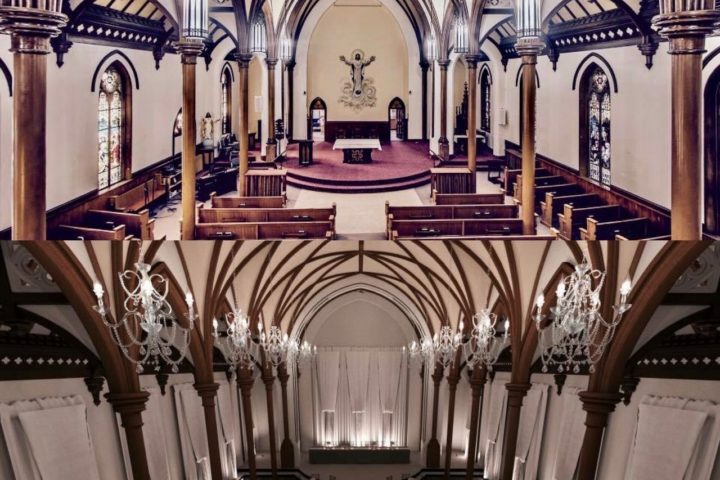 Last spring, Natasha and Paul Tobias-Cooper got the keys and green light from Saint John city hall to re-develop the old Cornerstone Church on Leinster Street. It meant taking their business to a whole new level. “I spent years handling as many as eight to 15 weddings a weekend. Even with my husband Paul helping, seven DJs on contract and a full-time staff member to help, we were constantly on the road. We knew it was time to look at getting our own spot in Saint John,” says Tobias-Cooper. They knew the heating bill might be higher in a church that was more than 100 years old and they put money aside. Then, they realized the temperature couldn’t be adjusted on the existing heating system and they started to panic a little. “We got help from Enterprise Saint John, thank goodness. I ended up talking to another entrepreneur and they told me ESJ offered a low-interest loan. I didn’t even realize the Impact Loan existed,” says Tobias-Cooper. ESJ’s Entrepreneur Development Officer, Dakota Lutes, says 24 entrepreneurs took advantage of the loan last year. The 24 loans given by Enterprise Saint John collectively leveraged $2,447,880 in additional funding for the new businesses. “We are doing everything we can to grow the culture of entrepreneurship in our region and make it easier for people to take a concept from business idea to launch. We also know the right support can mean so much more to our economy. Those 24 entrepreneurs ended up creating 47 full-time jobs in our community,” says Lutes. Tobias-Cooper says the $25,000 loan gave them a bit of breathing room. The Cornerstone Church Venue is booked every weekend from mid-June until October and now Tobias-Cooper is looking at developing Holy Trinity Church across from the Chateau Saint John. “Our community needs risk takers, like Natasha and her husband. Dreamers and believers, I’m proud that ESJ can be there to support people in taking risks to start and grow businesses in our city,” adds Lutes. The couple recently posted a photo and rendering of their new vision for “The Rockland” venue on their social media channels. They hope to have it open by June of 2019.